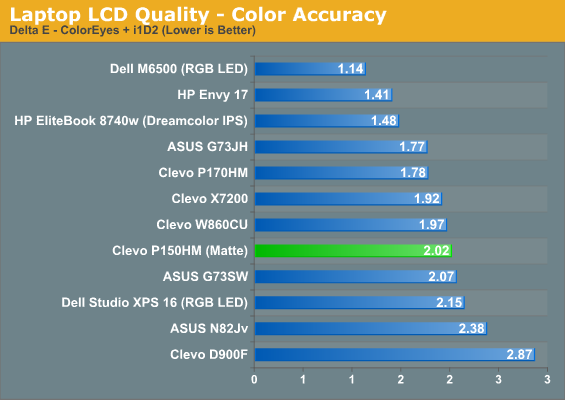 If you’ve been following our laptop reviews for any length of time, you’ll know that we’re suckers for a good quality LCD. 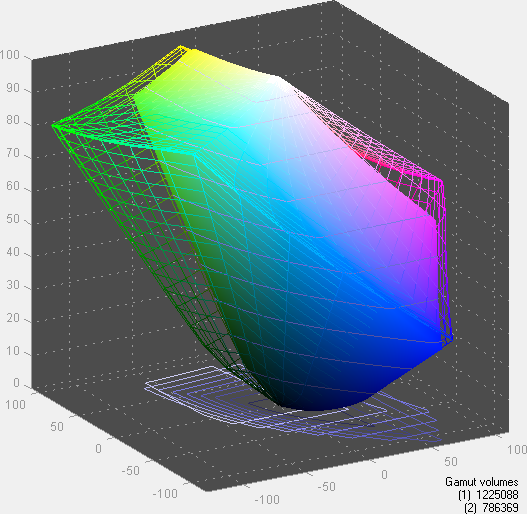 What makes a good LCD? Well, first we really need at least a 500:1 contrast ratio, and higher is always welcome. Next, we’d like good viewing angles, but we’re generally disappointed in this regard as just about everything uses TN panels (with HP’s IPS DreamColor LCDs being the rare exception). 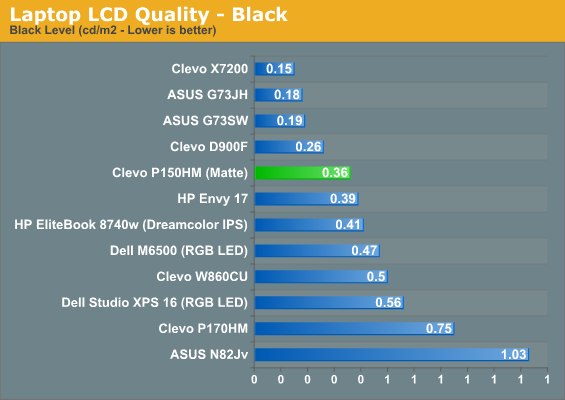 We understand some people prefer glossy LCDs because they like the increased contrast, but I think everyone here at AnandTech would prefer a good quality matte LCD to anything glossy (emphasis on good). 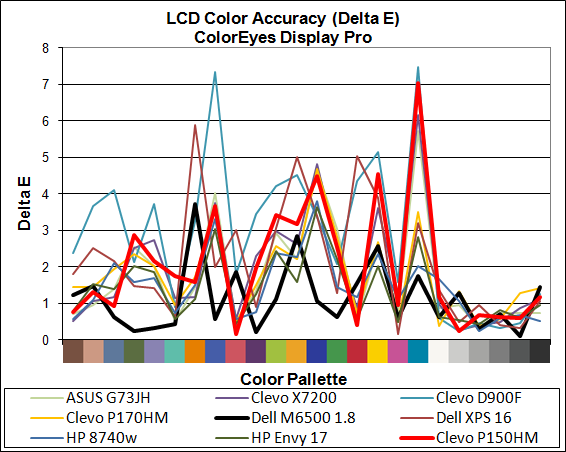 Having a large range of brightness levels is also desirable. 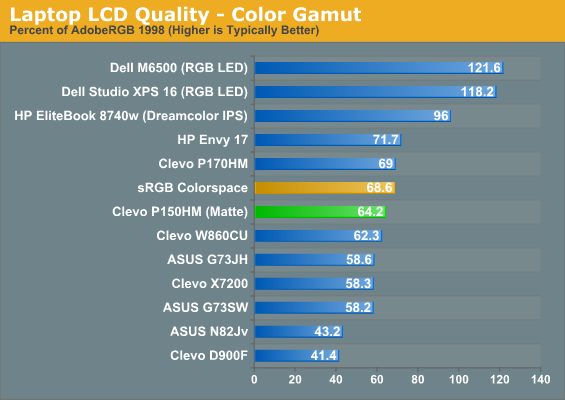 Finally, good color accuracy and color gamut round out our wish list; since most of us tend to work in the sRGB color space, all we really need is about 65 to 70% of AdobeRGB, but we’re okay with slightly higher gamuts (particularly if the laptop includes an option to select your target color space). 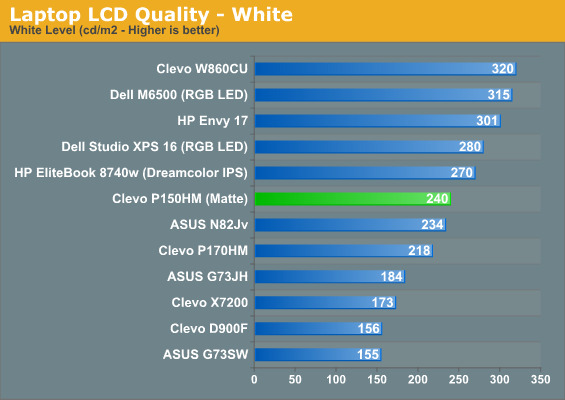 So, how does the panel in the Eurocom Racer measure up to this list? Let’s see…. The Eurocom Racer misses out on viewing angles, as it’s still a TN panel, but as the images below show it’s not quite as bad as some of the competition. The contrast and colors are good, and we’re very pleased to get all this with a matte LCD. The only other area where we’d like to see improvements is backlight intensity. 240 nits is reasonable for indoor use, but we’re prefer at least 300 if not 400 nits. There are definitely better LCDs out there—like HP’s DreamColor panels—but this is a good and reasonably priced panel. We’re still floored that it’s actually more expensive for the glossy 1080p panel, but to each his own. I’d rate the panel overall as a competitive solution to Dell’s XPS 15 and some of the other good 1080p LCDs we’ve seen in the past six months, but for me the matte coating pushes it ahead of the competition. Now if only the bezel matched the LCD…. 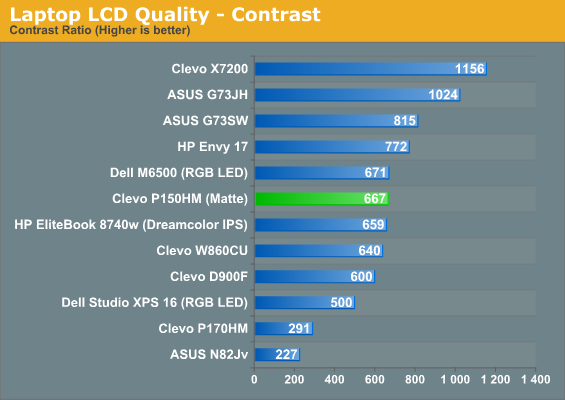 Re: "by Jarred Walton on 3/17/2011 3:00:00 AM"
Well, the Dell Precision M6500 has a 1920x1200 screen, 17".. and was reviewed on Anandtech.